7 Commercial Real Estate & Properties in Windsor are listed in 3 categories. We have 3 Retail ShopsLease , 3 OfficesLease and 2 Industrial Warehouses Lease . This well maintained 1st floor office is available from 1st July 2019. Convenient location with 5 6 designated car parks. Lease terms are flexible. There is open plan office area (with fitout, if needed), a separate office and large boardroom with kitchen facilities. Suitable for at least 8 staff. Staff amenities include, bathroom (with shower/bath) and separate toilet. The office is air conditioned, has alarm system, data cabling and recently renovated with a fresh appeal. The location of this quality strata unit provides ease of access to major Arterial Roads and Freeway systems. The property is also within walking distance to Bus, Rail and shops and is located across the road from Windsor Home zone. 140m2 office 5 6 Car parks Some signage available Outstanding near city location Directly opposite Windsor Home Zone Some warehousing space available Please contact the Agent to arrange an inspection. 360 m2 industrial unit + office Comprising 220 m2 tilt panel warehouse + 140 m2 office with superior fit out High bay lighting Electric container height roller door Fully air conditioned office (over 2 levels) 2 x private offices 1 x boardroom/private office Alarm system Toilet amenities on both levels Kitchenette 4 exclusive car parks at front of tenancy Pylon signage Excellent exposure to Newmarket Road Located directly next to the extremely busy Homezone Windsor complex, don't miss out on this opportunity. Inspect today! Call The Commercial Guys today to book your inspection or for further information. Unless otherwise stated, the price/property may be subject to GST and/or outgoings. Huge showroom well positioned on a highly sought after main road within the inner north of Brisbane. This property has a high quality presentation and bold signage opportunities. 600m2 Showroom / Retail 500m2 Warehouse/ Storage Unbeatable exposure Multiple Signage Opportunities Ample Car Parking Internal Lift with Loading Dock Opposite to multiple national businesses including Freedom Furniture, Chemist Warehouse, Beacon Lighting, Snooze and more. For more information or to arrange an inspection please contact Richardson Wrench Commercial Brisbane North. Lutwyche QLD Service apartment Two Ground Floor Commercial Tenancies for Lease, (Medical / Retail / Offices / Seminars) Consultation room & Mixed used office for lease Corner 186 Lutwyche Road/ Newmarket road, Windsor, 10 minutes walk from the Royal Brisbane and Women's Hospital just along Lutwyche Road. 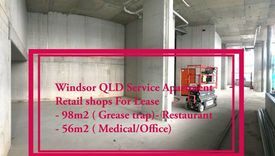 Tenancy A: Ground Floor approx 98m2 Tenancy B: Ground Floor approx 56m2 Tenancy A&B : 154m2 The locality Windsor is located approximately four radial kilometres north of the Brisbane Central Business District. Local shopping and school facilities can be found throughout the suburb. It is an older established inner northern suburb containing a mixture of character housing, multi unit residential buildings of various ages and quality. In recent years, as with most inner suburbs, Windsor has undergone rejuvenation with the splitting of larger parcels to accommodate infill development, construction of replica housing, and renovation of the popular Queenslander style dwellings. Situation The property is situated on the corner of the intersection of Lutwyche Road and Newmarket Road. Infrastructure The property is located close to infrastructure including major arterial roads being Gympie Road/Bruce Highway Inner City Bypass and Clem 7 Tunnel. It is close to The Royal Brisbane and Women's Hospital. Building Proposed to be erected on the property is modern style, six level complex comprising ground floor reception with two retail/office tenancies, 28 Apartments, recreational facility (single and dual key) over five levels and two levels of basement car parking. The development provides a total GFA of 2,479 square metres plus balconies. Serviced Apartments 1 bedroom apartments are available between 50 59sqm, incl. 10 13sqm balcony. 2 bedroom apartments are available from 85 to 97sqm, including a balcony of 10 13sqm. All bedrooms will comprise a king sized bed, side tables and built in robe. High speed internet and free WiFi will be provided as well as HDTV. Air conditioning/ heating: Split system air conditioning to each room. Available on FEB 2019 Price: Contact Agent Inspection: By appointment Address:186 Lutwyche road Windsor QLD Contact: Conan Li 0404 617 767/07 3373 9887 Email: conan.li@yong.com.au Disclaimer: We have in preparing this information used our best endeavours to ensure that the information contained herein is true and accurate, but accept no responsibility and disclaim all liability in respect of any errors, omissions, inaccuracies or misstatements that may occur. Prospective purchasers should make their own enquiries to verify the information contained herein. RW Wilston Windsor occupy the ground floor office and are looking for a co tenant to occupy the upstairs office area. Lease terms are flexible and space is available from 1st March 2019. There is open plan office area (with fitout, if needed), a separate office and large boardroom with kitchen facilities. Staff amenities include, bathroom (with shower/bath) and separate toilet. The office is air conditioned, has alarm system, data cabling and recently renovated with a fresh appeal. 100m2 warehouse also available The location of this quality strata unit provides ease of access to major Arterial Roads and Freeway systems. The property is also within walking distance to Bus, Rail and shops and is located across the road from Windsor Home zone. 135m2 office 2 Car parks Some signage available Outstanding near city location Directly opposite Windsor Home Zone Please contact the Agent to arrange an inspection. 250m2 Office/Warehouse over 2 levels Access via container height roller door 3 On site car parks Unrivaled exposure to passing traffic Ideal industrial unit strategically located on Newmarket Rd with ease of access to the north side of Brisbane and major road systems, this great exposure provides signage potential. Would suit wholesaler, storage, trade and office. For further information or to arrange an inspection contact Richardson Wrench Commercial Brisbane North now!